Streetcars are back in the U.S. in a big way. Inspired by the Portland Streetcar, and helped along by federal programs like New Starts and TIGER, cities across the United States are breaking ground and beginning service on modern streetcar systems. The four lines expected to open in 2014 are in DC, Tucson, Seattle, and Atlanta. 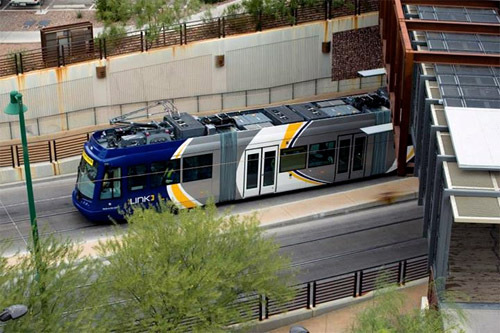 Tucson’s Sun Link streetcar will be the first modern rail transit to open in that city. Seattle’s First Hill streetcar will run next to a cycletrack for much of its length, in an impressive multimodal layout. Atlanta’s downtown streetcar will be the first modern streetcar to open in the US that doesn’t use the ubiquitous 66? long streetcar model first popularized in Portland. Instead, Atlanta will use a 79? long tram similar to the light rail cars in Norfolk. North of the border, Toronto will shortly begin to use new 99? long trams on its expansive streetcar network, the largest in North America. Even more cities will begin construction or continue construction on new lines that won’t open until 2015 or later. They include Charlotte, Cincinnati, Dallas, Detroit, Fort Lauderdale, Kansas City, Milwaukee, New Orleans, Oklahoma City, Tempe, San Antonio, and Saint Louis. Many other cities, including Arlington, have streetcars that aren’t expected to begin construction yet, but aren’t far behind. It will be interesting to see what kind of impact these streetcars have on transit and urban development in these cities, especially the smaller ones that haven’t had any rail for decades. Elsewhere on the Network today: Missouri Bicycle Federation shares the news that Jerry Seinfeld really likes to walk or bike to work. Cyclelicious speaks with a leading bike advocate about the importance of social media in uniting people around the cause. And Parksify shares a great adaptive reuse idea from New York City: transforming a parking lot into an ice skating rink.